Just pulled the trigger on this one. It appears to be a VERY early BST-62 in what I think is Dakota Red. I think it was a pretty good buy at the price. What do you experts think? Any tips? Hi, I've got a nice BST-62 on the way as well so I can share your excitement. The pic's aren't good and the info is scarce so I can't comment much about the guitar itself. Did you get any more pic's? If not be sure to post lots when it arrives. Yeah John the strong Aussie dollar was a BIG factor. There are more pics here. The headstock has NO LOGO so it may be either a very early model or a custom build. Either way its a Bacchus and from everything I've read it's Custom Shop quality guitar all the way and Nitro finish too! Missing logo on headstock bothers a lot of people (not me and sometimes you can get a great guitar for bargain - just like in your case. +1 sometimes you have to take a risk. When you get it check for a ghost of the logo on the headstock and let us know the serial number off the neck plate. I'm going to withhold comment until then (I do think it is Bacchus though). Bacchus also makes OEM guitars without logo, could be one of those. Thanks to all for your input. I guess It'll be about 10 days before I get it. I used Rinkya for the first time ever so I'm also slightly nervous something could go wrong. As soon as she arrives I'll post more info. Very nice, I love the blue one! I'm curious as to how these sound up against a genuine Fender. 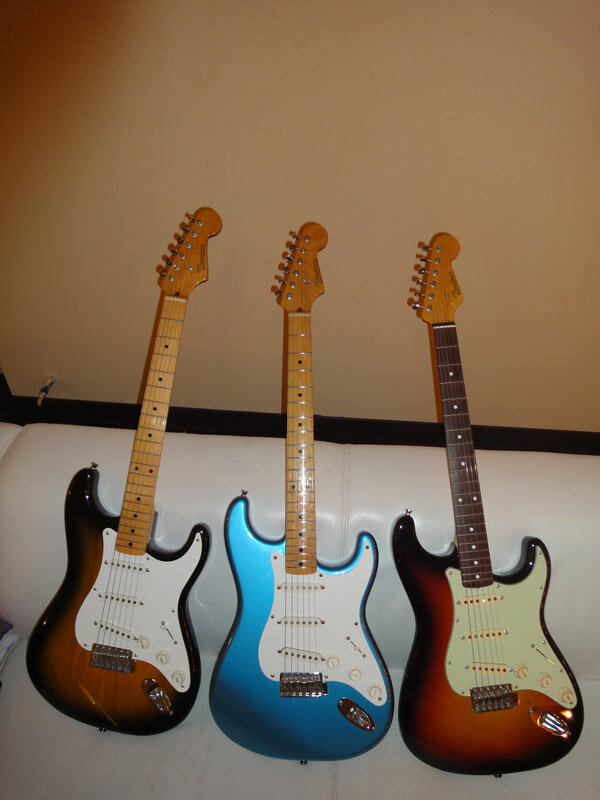 I have 2 MIJ Strats from the early 90's. Basswood bodied '62 reissues with cloth American pickups and I like them very much. How does a Bacchus stack up? Fatter sound? Bigger necks? My two BST -64V's have fairly chunky C profile necks. The pickups on the Bacchi are totally different than on my US Strats. Much beefier output and LOUD. Even the bridge position is fatter than the somewhat shrill and feeble tone of it's US cousins. I'm a big fan of them.... shame I didn't discover them sooner.